Gauges 11, 15, 22, 30, 40, 50. 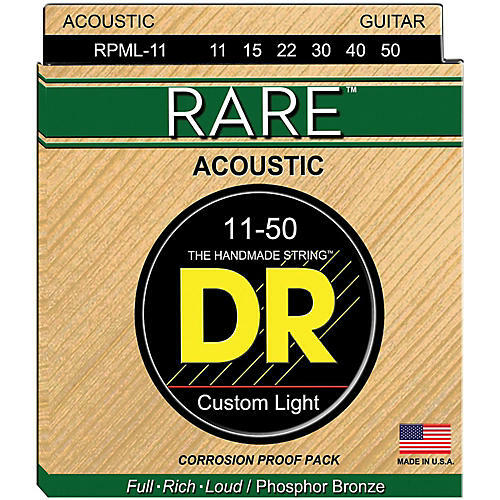 RPML-11 Custom Light RARE Phosphor Bronze Acoustic Strings from DR Strings are a departure from the standard, good quality bronze string currently available -- not necessarily better, but possessing a new, different, and stronger voice. Hand-carved archtops, dreadnoughts, and good steel string acoustic guitars of rosewood, maple, and mahogany benefit from a distinct improvement in tone, depth, and sustain with a fatter, louder sound and a deeper bottom.